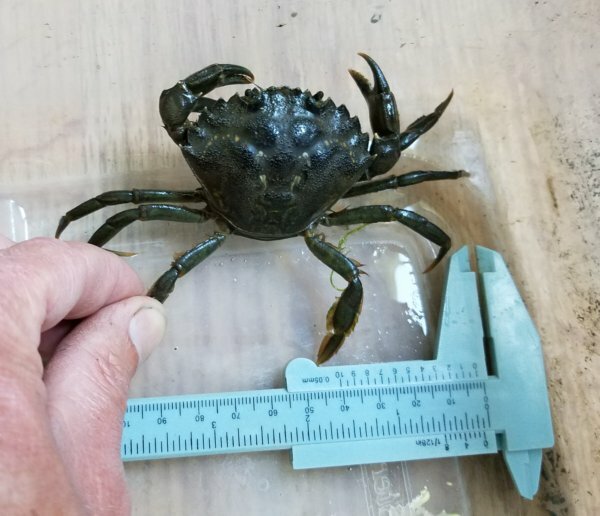 A single European green crab was captured in Sequim Bay last week by Neil Harrington, an Environmental Biologist with the Jamestown S’Klallam Tribe. Since the discovery of a small population of green crab in nearby Dungeness Bay this April, Harrington has been steadily trapping his way around Sequim Bay on the lookout for more of the invaders. Intensive trapping by Harrington and coworkers over the last week did not capture any additional European green crab, suggesting that this crab is not an indication of a large established population. The crab, a female 52mm in carapace width, was trapped in a channel in Jimmycomelately estuary, at the south end of Sequim Bay. Based on her size and location, it’s most likely she was washed in during 2016 as a larva. So far, it appears this female crab is lonely; no other evidence of European green crab presence in Sequim Bay has been confirmed to date – a good sign. Sequim Bay is the largest pocket of good green crab habitat near Dungeness Bay, where, to date, 89 European have been trapped and removed*. The concern was that if green crab larvae got washed into Dungeness Bay, some might have also made their way to Sequim Bay. 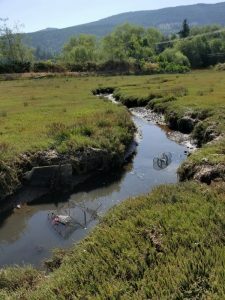 Harrington and the Jamestown S’Klallam tribe initially partnered with Crab Team after hosting a training workshop at the tribal center in Blyn this spring, before the captures at Dungeness Bay had even occurred. 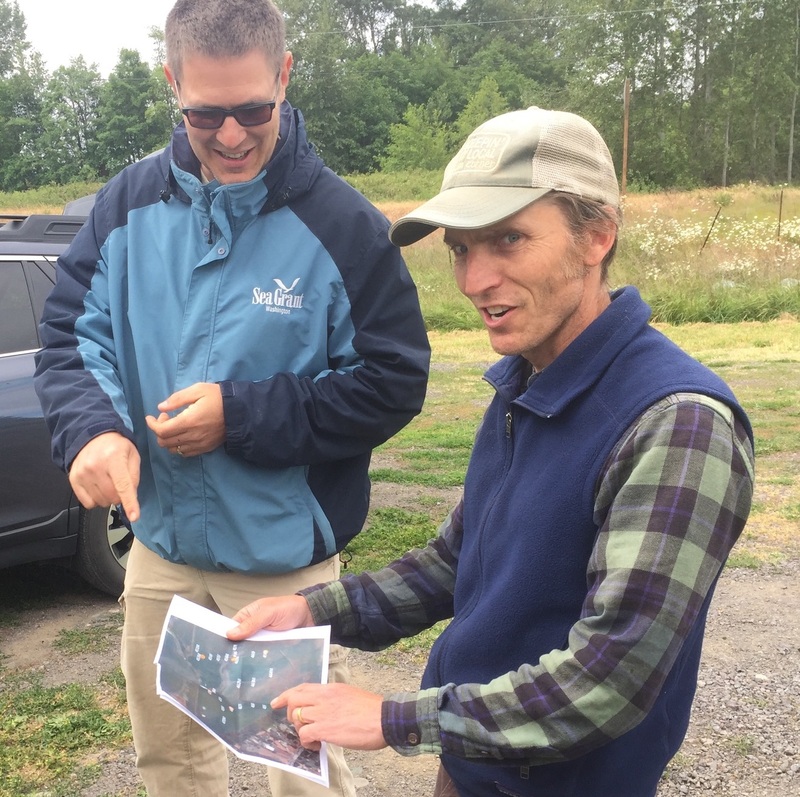 Crab Team toured the south end of Sequim Bay, and discussed other areas that might offer good habitat for green crab with Harrington and Hilton Turnbull, a Forest and Fish Biologist with the Tribe. Both were eager to become involved with the project, and Harrington joined Crab Team volunteers in launching the monitoring site at Washington Harbor, at the mouth of Sequim Bay. Finding green crab in Dungeness Bay in mid-April generated renewed concern over Sequim Bay, and Harrington offered to conduct exploratory trapping in areas identified as good habitat. Over the course of this spring and summer, Harrington set 50 traps in Jimmycomelately estuary before he captured this crab (see header image, green triangles indicate some of the trap set locations), and dozens of traps in other parts of the bay, including Washington Harbor, and Travis Spit (on the east side of the mouth of Sequim Bay). Since last week, he and his crew have deployed 119 trap sets in Jimmycomelately estuary, and turned up no additional green crab. If European green crab are getting washed onto Washington’s Salish Sea shorelines as larvae, the occasional discovery of small, isolated pockets of a crab or two is not entirely unexpected, but it is informative. We can now confirm that larvae have reached this part of Sequim Bay, and we can therefore prioritize this site for ongoing monitoring. While the intensified trapping reassures us that there is not a large infestation in the estuary, it doesn’t enable us to conclude we have removed every last crab. All of the European green crabs captured to date in Washington’s Salish Sea (our map has an updated layer of all individuals confirmed) were from the 2015 and 2016 year classes, possibly benefitting from the warm El Nino event years. We will need to continue to keep an eye out, however, for more green crabs. Now is the time of year when the young that hatched in early 2017 could be large enough to start appearing in traps. Partnerships with natural resources professionals like Harrington and the Jamestown S’Klallam are a critically important component of such a large early detection effort. Agency and tribal biologists spend a lot of time in mud, so equipping them with information on green crab means that they can be on the lookout wherever they work. Protecting Washington’s shorelines will require that we cast a wide net for European green crab; when more people know what to look for, we improve our chances of reducing or preventing damage by this global invader. *Update on Dungeness Bay: Removal trapping efforts by UWFWS are ongoing, but numbers of European green crab being captured appear to be declining. The last one trapped was captured on August 4th, and none have been caught in the 300 trap sets conducted since then. Trapping will continue through September as tides allow personnel to access the area.